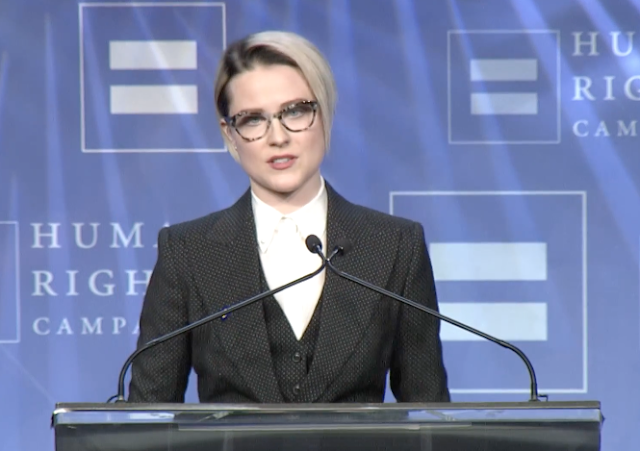 Actress Evan Rachel Wood delivered a powerful and heartfelt speech in North Carolina over the weekend at a Human Rights Campaign Gala, opening up about being bisexual people and the responsibility she feels as an LGBTQ public figure. The 29-year-old actress confessed she found herself attracted to women at age 12 but didn’t think it was unusual. “I also thought that men were beautiful,” Wood adds. She explained that learning to use her voice, despite being taught to stay silent, gave her hope. In a speech laced with quotes from civil rights leaders Audre Lorde and Nina Simone, Wood stressed the importance of artists using their voices to reflect the times. Wood came out as bisexual on Twitter in 2012. Wood ended her speech by paraphrasing a powerful quote from E.E. Cummings: "To be nobody but yourself in a world that is doing its best to make you somebody else, is to fight the hardest battle you are ever going to fight. Never stop fighting."